Here is Thursday and we have broken back up to new highs on our cyclical models without electing a bullish reversal yesterday. Resistance stands at the 17195 level and a closing below 17000 today will imply that we have a high in place. 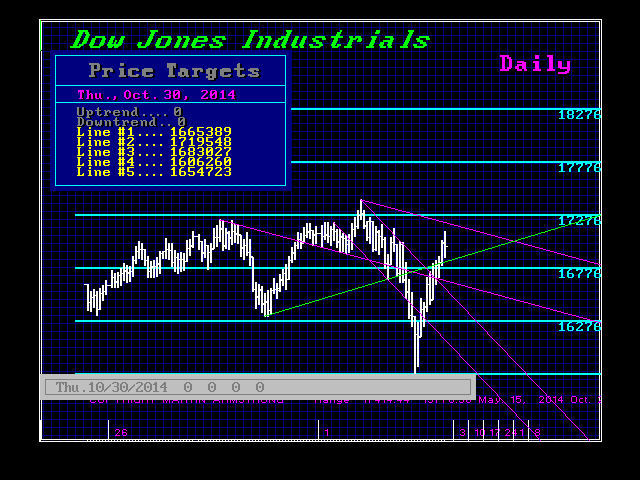 Closing resistance will stand at 17010, 17143, and 17246. We need a closing above at least 17,143 to imply that we could continue higher into next week. Otherwise, a failure to closing above 17142 will suggest we may have the high today. Tomorrow is the end of the month. We are looking at a closing below 16898 tomorrow will suggest that we should press lower. A closing tomorrow below 16920 will imply that we may see a break next week back to test support. « Greek Bonds Get Smashed – Prelude to the Euro Crisis?